I love listening to podcasts, watching video blogs and such. I get to learn so much about the specific topics I'm interested in... best of all, they're free!!! My favorites mostly comprise of video-editing software how to's as well as animation-related podcasts. So I subscribe to a few and whenever I get some free time, I watch them (if there's video prez) or listen to them with my ipod and that's it! Tons of ways to learn new things beyond books these days :o) LoOOOooove it! 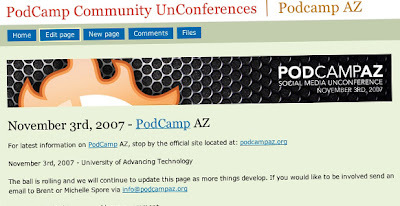 This coming Saturday, Nov 3, Podcamp AZ will be held in Phoenix. Podcamp started in Boston, Massachusetts sometime last year and is now widespread among several US states and around the world. There, you can get together with fellow techie geeks who are passionate about the internet videos, blogging, new media, etc etc. Good networking opportunity if I may say. There are 2 things in there that I know I wouldn't want to miss. First, iJustine is going to be there (you know, the iPhone gal who had her viral video all over the internet because she just got her 300 page iPhone bill from ATT??). I've been a fan of her website even before she became an internet celebrity because she's a mac fanatic as well. So, I would get to meet her there if ever! Then this video genius guy of Izzy Video whose website I usually checkout because of his awesome tips and tricks on video editing and such. He's one of the presentors and it's an opportunity of a lifetime! Goodness gracious great balls of fire!!!! What's holding me is I dont know anybody there and I dont know who can I tag along with me so I wouldn't look too pathetic that I am coming just by myself. I mean, what if they're all snubs? Hmmm.